The violence erupted in the night between 11 and 12 February in the village of Pelauw, about an hour from Ambon. A disagreement on the ritual to bless a house sparked the confrontation. AsiaNews sources said that the dead could be "over 11".Thousands of evacuees seeking food and shelter. Jakarta (AsiaNews) - At least five people died and more than 300 homes were burned in recent clashes between two different Islamic groups in the village of Pelauw, the sub-district Haruku, about an hour away from Ambon, capital of the Moluccas (eastern Indonesia). The clashes erupted in the night between 11 and 12 February, in a province long the scene of Muslim-Christian sectarian violence and power struggles within the Muslim community itself. The last case was in mid-December (cfr.AsiaNews, 12/14/2012 Ambon, more Muslim-Christian violence: 16 injured, houses burnt), when an urban warfare broke out between the Muslim majority and Christian minority triggered by trivial reasons. 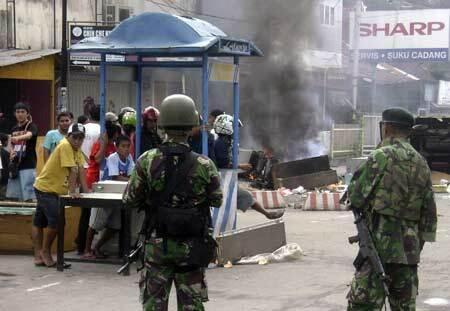 Johanis Huwae, Maluku police spokesman, confirmed the report on the recent violence and added that today thousands of people have fled their homes and properties, in search of safer places for shelter. At the root of the violence, said the spokesman, is a "disagreement" between two different Islamic groups, over a "ritual ceremony" for the inauguration of a house. Local sources tell AsiaNews that the death toll could exceed official figures provided by the police. The dead "would be more than 11," says a villager on condition of anonymity. Abdullah Tuasikal, a senior official of the Central Maluku, added that at least 3 thousand "homeless" people are looking for makeshift dwellings in nearby villages. In addition to shelter the displaced people urgently need food, water and other basic necessities, including clothes. In the past, there were harsh sectarian violence between Christians and Muslims in the Moluccas, that have caused a high number of dead and wounded. The arrival of thousands of Muslim settlers, coming from other parts of Indonesia, in 1999 triggered the conflict, which continued until 2002 and has caused at least 9 thousand victims in repeated accidents. The signing of a peace treaty between the two sides in February 2002 - the Malino Peace Treaty, signed in South Sulawesi - put an end to the conflict, but there are still sources of tension.